Our full line of services starts with aiding you in the initial decision of which type of conduit best suits the crossing to be made. After that, our experienced staff can take the job from start to finish – from assisting with the designing of the route and method of attachment to the bridge to obtaining all necessary permits and approval. We can also custom fabricating the hangers/conduit supports and manufacturing the conduit. Additionally, if you wish, we can arrange for the actual installation and inspection of the job. From the simplest single conduit crossing to the most elaborate custom supports, OMNI® is your one source supplier for all of your bridge crossing needs. The materials we recommend are carefully selected with attention to weight considerations, strength, and protection of the exposed conduit. 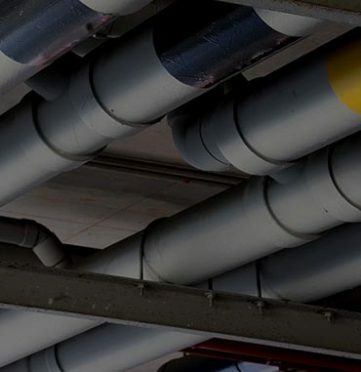 We have found that for many jobs, our Fiberglass Reinforced Epoxy Conduit, especially in the bullet-resistant wall thickness, is the optimum conduit material, providing maximum protection while being much lighter than steel, highly resistant to corrosion and non-conduction. Our fiberglass conduit is available with a complete complement of sweeps and fittings including expansion joints. Our various hanger brackets are constructed of a combination of fiberglass and galvanized or stainless steel to be strong, lightweight, and long lasting. Every job is considered individually to assure the best solution to each specific situation.